Since the HM30 on New Year’s Day I had been training for this event and was really looking to running on his great route. Katrina and I were able to finish work early so we left Paisley at 1.40pm and enjoyed an easy drive to Helmsley arriving at 6.30pm. We were staying at the Youth Hostel with 36 other runners. We settled into our room that we were sharing with Flip and Anna then went into town for some food. Early to bed but I didn’t sleep too soundly. Woke at 1.30am and then dozed on and off until my alarm went off at 5am. The hostel was busy with runners getting some breakfast before heading to the town square to catch the coach to Guisborough at 6am. I met Malcolm a fellow Liverpudlian so we sat together and chatted all the way. Malcolm couldn’t believe much lighter my bag was than his but when he explained how much food he was carrying I wasn’t surprised! When we arrived at Guisborough Rugby Club I met birthday boy Dave Troman so we went into registration together. 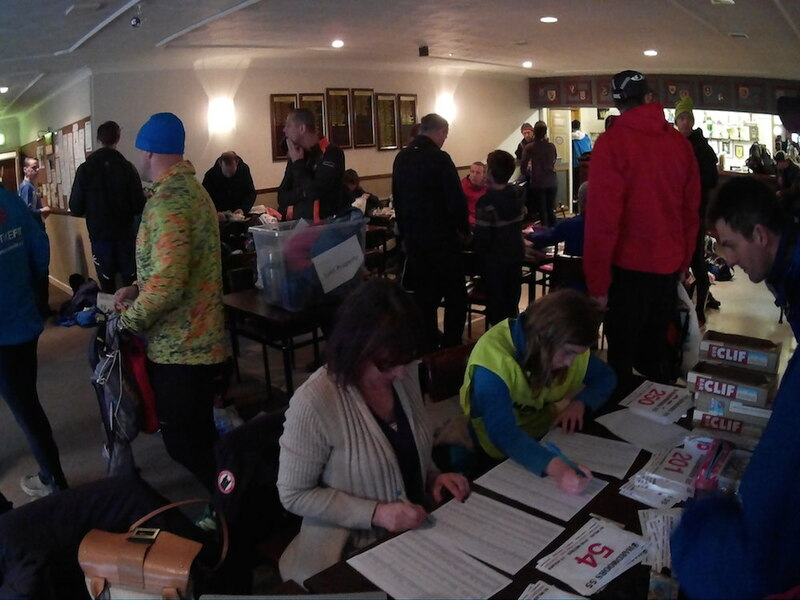 Jon and Shirley had an efficient kit check going and we soon were all sorted with our race numbers. I was 123 which was an easy number to remember!! Jon had been given 10 trackers to try out on the race and asked if I would like to carry one. I was really keen and had put a link on facebook and twitter so friends could follow me! I put the tracker inn a pocket on my shoulder strap. Dave and I chatted and soon enough it was the briefing where Dave and I both got a mention for our birthdays! Once outside I got a photo and the joined the runners on the cycle track. A guy called Adam introduced himself. He is a friend of Mark Johnson who I met at the Lakeland 100 in 2012. 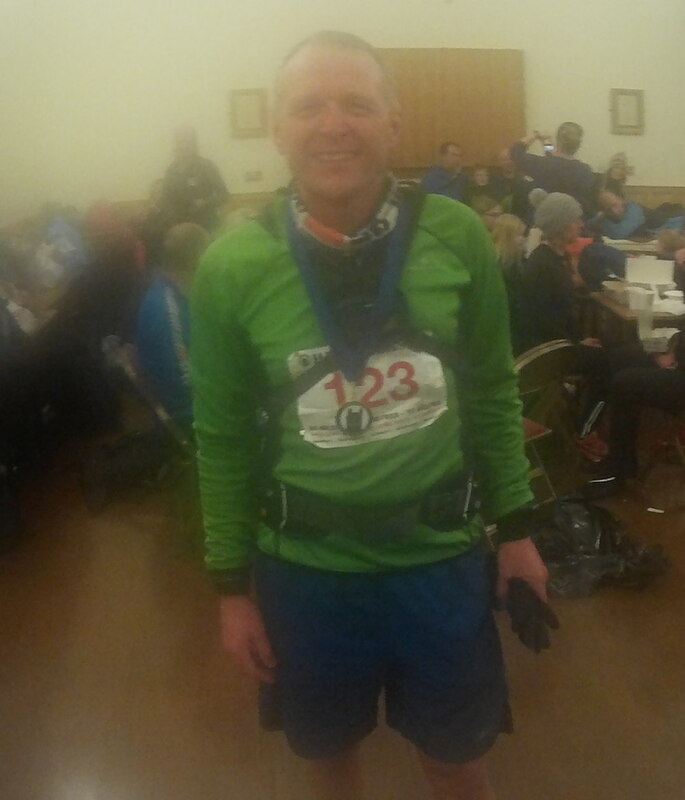 Most runners seemed to be wearing jackets but I was happy in my base layer and green top and only put on my jacket for about 15mins when we had a hail shower. Right on 9am the race started and we were off. I ran with Adam and we chatted about the Manchester Marathon that he did last year and Katrina is doing this year. Adam gave me some great tips about supporting the race and promised to send an email with ideas. 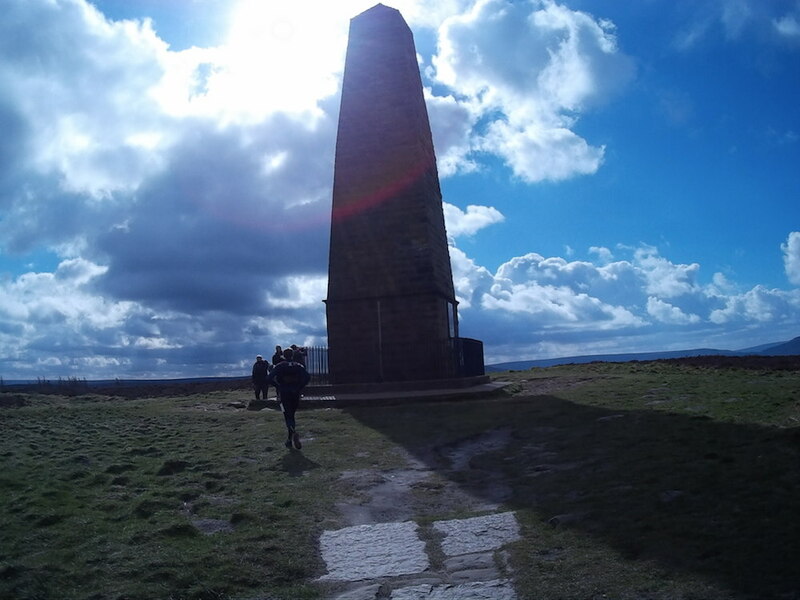 Their was a marshall after a mile or so to direct us up the path and back onto the Cleveland Way. I reckon I started around 50th place and caught a few people as we walked/ran up the hill. We had started in sunshine but within a few minutes it was hailing but it didn’t last long. I went past a few people stopping to put jackets on but I reckoned it wasn’t going to last long and it didn’t! I think there were about 200 starters and very quickly the field spread out. I had put the route on my Suunto and it was excellent. Whenever I needed to check which way to go I could have a quick look and make sure my arrow was on top of the line showing the route. Before the race I’d wondered whether I’d see the leaders and Dave in particular coming back from Roseberry Topping as I made my way out. I went through the gate leading to there hill and sure enough I saw the leader coming towards me. I counted 8 runners before Dave. I had my video camera ready to video our crossing. Dave looked as though he was going well and I fully expected him to finish no worse than 9th! I tried to count how many runners were coming towards me and hope many were on the hill ahead of me. A rough count put the figure at 35 and I reckon I wasn’t far of. I climbed up to the top at a steady pace feeling good. The views all around were great and I was loving the race and the early miles. 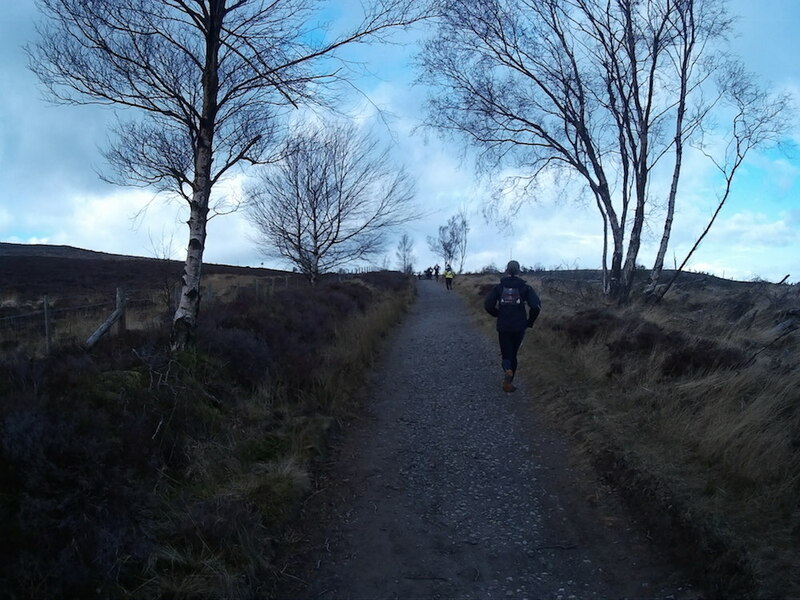 I set off down the hill as lots of other runners were making their way up. I’d watched a fair few runners coming down to the left (on the way down) so decided to go that way. I think it was easier and also meant that I had a clear run down instead of passing all those coming up. I greeted as many runners as I could as I passed them. It was good to see Malcolm who commented that I was looking good which always is encouraging! I wonder whether he’d eaten his pasta yet? I was on my own with a few runners ahead so I concentrated on running nice and steady and keeping my heart rate comfortable. I ate a lice of fruit bread and jam and drank some of my energy drink. On the climb up to Captain Cook’s Monument one guy went past me running but I was keeping up by walking with a few bits of running. I’m not convinced that it’s worth running at this point. You can see from the photo that the sun was shining and it was a lovely day. 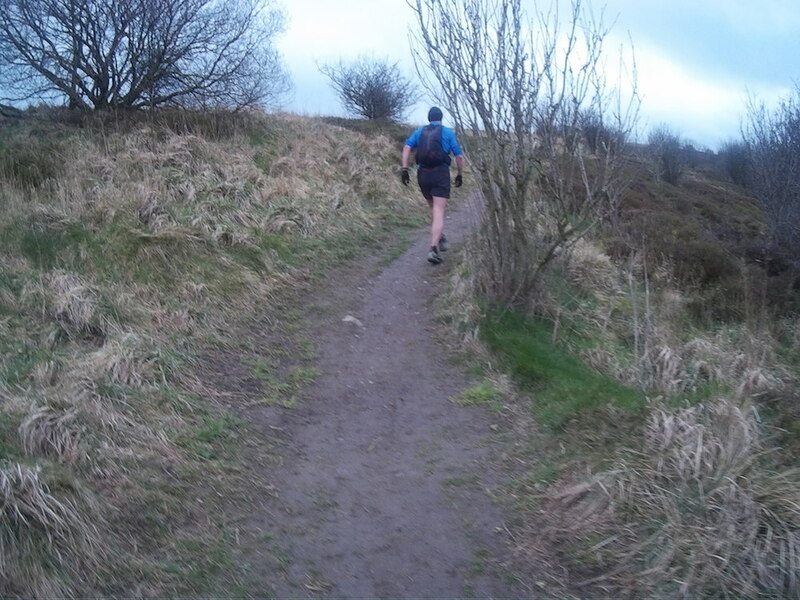 It was pretty windy at times but generally a great day to be out running and enjoying the route. This is my third race on the route. In 2009 this section in the HM 110 was in the dark so I didn’t see much. Then in 2010 when I ran HM55 the visibility was zero so it was great to be able to see the views this time though I was heads down most of the time working hard! I had rough splits with me aiming for 10.45 and I was ahead by Kildale which always helps with morale. Jon Steel was there so it was good to get a handshake and encouragement. Shirley was inside taking times and numbers. I had a drop bag and within a couple of minutes I’d eaten some sweet potato and a very helped marshall had refilled my water bottle. As I left Kildale Dave Kamis was arriving. I’d run with Dave a lot during the 2009 HM 110 and he is a very good runner so was slightly surprised to see he was behind but assumed he would catch me later on (but he didn’t!). It is quite a climb out of Kildale so I settled into a steady rhythm. Looking at my data afterwards I see that in the 3.5miles from the checkpoint I climbed over 700 feet. I caught up with a guy called Neil and we ran together for a while. Neil has done the West Highland Way so it was good to chat about various races. Once the route turns left and onto the track there is a very runnable 2.5miles to Bloworth Crossing. I was feeling good so settled into a good running pace averaging sub 9mins per mile of this bit. I could see a line of about 10-12 runners ahead and wondered if I would catch them. I was slowly gaining which was fun! 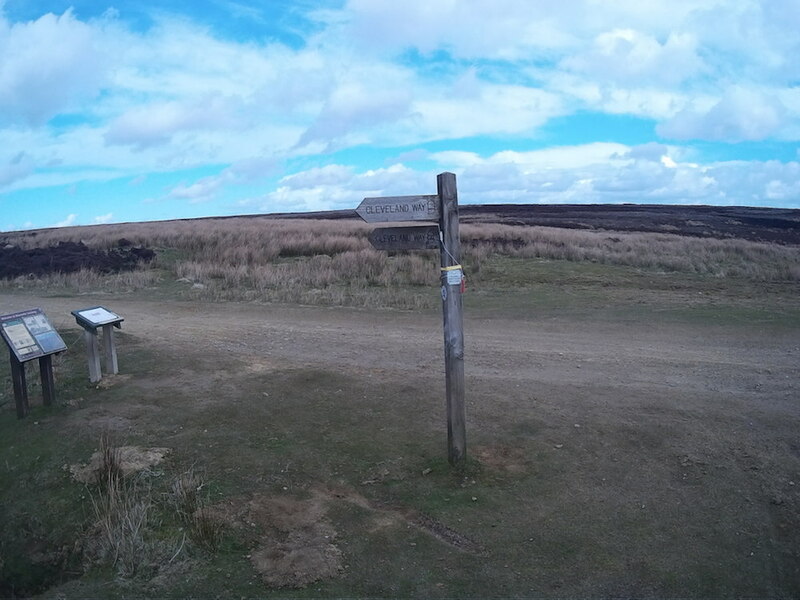 I arrived at Bloworth crossing and clipped my number and set off down towards Clay Bank. Soon after the self clip I caught up with the group of runners and went past a few of them. I had a quick word with each but some where more chatty that others. As I went past one guy he said I recognise that accent. It was Phill Turton who I was wanting to meet. 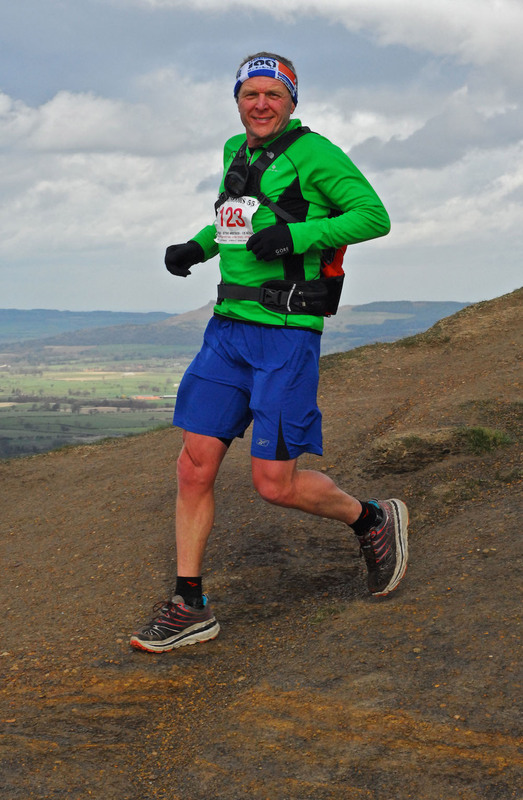 We have been in touch on Facebook and Phill had interviewed me last year for the Great British Trail Running Podcast. Phill is concentrating on the HM 110 and had said that he was going to treat the HM 55 as a good training run. I’d mentioned on Facebook that once he had a number on he’d be racing. I reminded him of that but he said I am taking it easy! I told him we were on sub 10.30 pace but he assured me he was going to take it easy on the second half. As we made our way down towards Clay Bank I suddenly realised that I couldn’t feel the tracker on the rucksack. I took it off to have a look and it wasn’t there! I thought it must have fallen off. I felt really bad as they can’t be cheap! I also realised that if it was lying somewhere and no-one saw it then anyone following me would think I had moved for hours!! I couldn’t do anything about it and just hoped that someone would see it and pick it up. At the next check point I saw Ray and explained that I’d lost the tracker and could he let Jon know so he wouldn’t worry about me!! A runner who heard me ask Ray told me I would have to run back to find it!!! More on this later! As I refilled my water bottle with my energy drink the group I had overtaken were now in front of me again. Over the next few miles I leap frogged with a few of them. Basically I was quicker on the flats and uphill but they were all faster than me on the downhills. I’m working on my technique but watching others go past me I realise that I am too cautious or too much of a ‘girls blouse’ when it comes to descents! 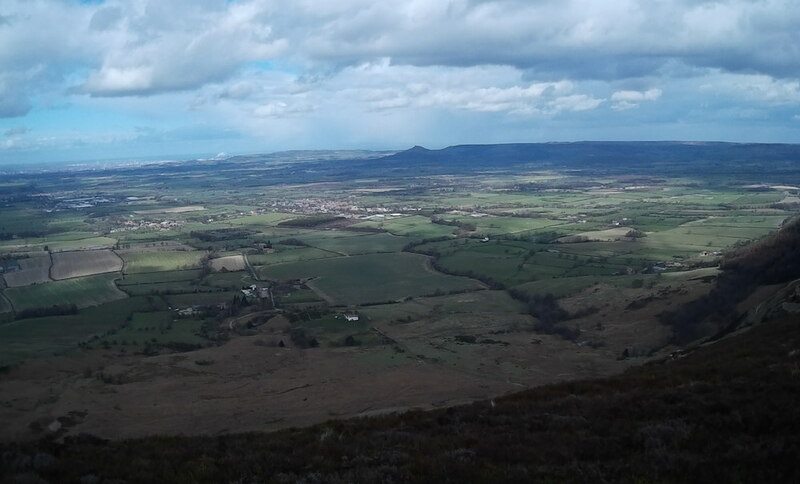 The views were really good along this section and I took this photo looking back towards Roseberry Topping …. As we came over the wainstones the photographers from Summit Fever were there again so I bought another of their photos …. As I descended to the next check point at Lords Stones Adam caught me and we ran in together. Adam seemed to be going well but said he’d had some cramp. I told the marshals there as well about my lost tracker and was out again as I didn’t need anything. As I climbed out from the checkpoint I tried to eat a bit more of the cliff bar I’d been nibbling on for the last hour or more. I was drinking my Matrix energy drink regularly and feeling as though I had enough energy. My legs were working well and no issues at all with my Hokas. They were superb on the trail and really came into their own on many rocky path. I was continuing to do my video clips which I’ll put together in the next few days. I’m really pleased with my new video camera. I was also taking note of the route and working out some mini-splits that will help me for the HM 110. In a few weeks Dave and I are going to recce the route from Kildale to Filey over 2 days but I won’t be on the route to Kildale until the race. Even though we are running the opposite way I tried to make sure I knew the key turns. I was regularly checking with my Suunto to keep me on track. I made one small error. There were 2 paths from a top and I thought it was the left one but very quickly I realised my arrow was off line so ran over the bracken to get back on track. As I descended to the road I was caught once again but was happy that I was still moving well and I was ahead of my 10.45 plan. I was really keen to go under 10.30 but wasn’t sure how generous I’d been with my timings! At this point we had a really heavy hail downpour. I put on my jacket as I was getting pretty wet. It stopped after a few minutes and I quickly warmed up so I took it off again!! I was on my own for the next mile or two past the self clip at the TV Tower and down to Osmotherly. My plan had me to the checkpoint in 6.05 and I arrived at 5.45 so I was pleased to see I was 20mins ahead of 10.45 pace so there wasn’t going to be much room for error! At the checkpoint I was asked to show my head torch which I was happy to do as it was near the top of my bag. 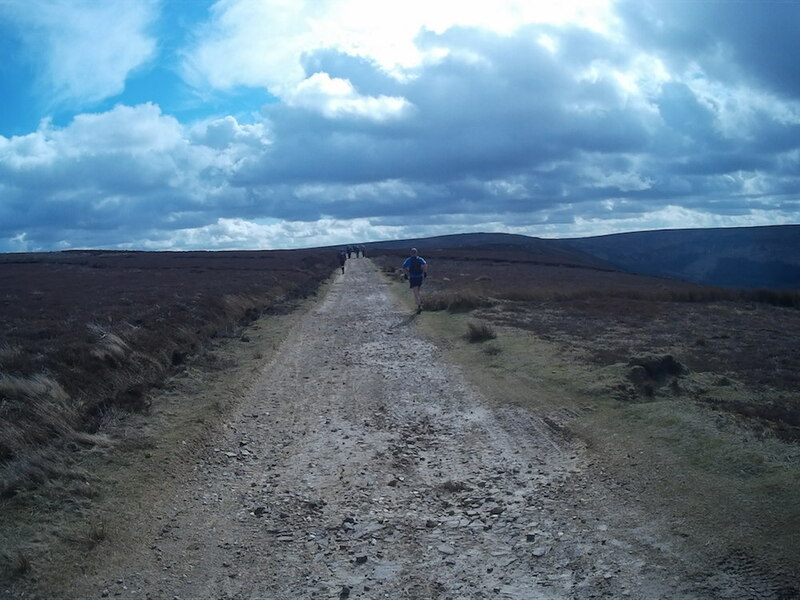 I sat down to eat my greek style youghat and sort out what I needed for the final 23miles. As I looked in my bag I saw the tracker!! It must have fallen into the bag. I realise now that the pocket I put it in on the should strap is actually a hole for a bladder! I was relieved that I hadn’t lost it and happy that friends will have been able to follow me! I asked the marshalled could they let Jon know that I’d found it!! I had just over 5 mins in the checkpoint and was ready for the final push for Helmsley. I had 22 miles to go and 4hrs 40mins to make my sub 10.30. That is an average of 12.43 mins per mile. I felt that was possible as there were lots of good downhill runnable sections to come. I quickly caught up with Neil who I’d run with earlier and Jamie. They seemed to be running well together so I tagged along and they really helped me over the next few hours. Two other runners went past us who I assumed had spent longer at the checkpoint. They were going really well so we watched them disappear in to the distance. I had done this section the day after the HM 30 so it was quite familiar. It’s quite a long climb up with almost 1,000 feet of climb. I was happy with my pace and once we got over the top we started running and I was feeling good. We chatted quite a bit about the West Highland Way Race and various other things and the time and miles passed. At one point I walked a bit to eat some food and drink and before I knew it they were a few hundred feet away. I assumed they were away and that was fine. I’d said to them earlier if I drop off they weren’t to wait for me. So I regrouped a bit and ran at my own pace and before I knew it I’d caught up with them again which was a real encouragement. I’d broken the 7miles or so to High Paradise into two sections and right on 4miles at a sign post I recored my mini-split. I now had just over 3 miles to the Farm. It was mainly downhill and we were running at just under 10mins per mile which meant my sub 10.30 was very much on! About half a mile before the Farm I saw a girl coming towards us and I assumed she must be supporting someone. As I got closer I realised it was my friend Cara who had seen on my blog I was doing the race and as she is working in Thirsk at the moment thought she’d come out and cheer me on! Cara had sent me a message on FB but the reception wasn’t very good at the YH in Helmsley so I didn’t see it. It was even better as I wasn’t expecting to see her. It’s amazing what a boost seeing a friend can do. So thanks Cara for making the effort to come out and cheer me on! I explained to Cara I was on target for sub 10.30 so she encouraged me to stick with Neil and Jamie and finish it off! I did my mini-split at the farm but the checkpoint was another mile or so down the track. There was a car with water and food so I refilled my bottle and took a chia bar to keep me going. Neil’s wife was waiting for him so he stopped to eat some food while Jamie and I pushed on. Jamie has two young girls and he was telling me how much they love supporting him. The younger one is only 2 and did get upset when he left the checkpoint so they have made it a game of hide and seek. When he leaves the checkpoint he is going to hide so they have to go the next checkpoint to find him!! What a great idea. 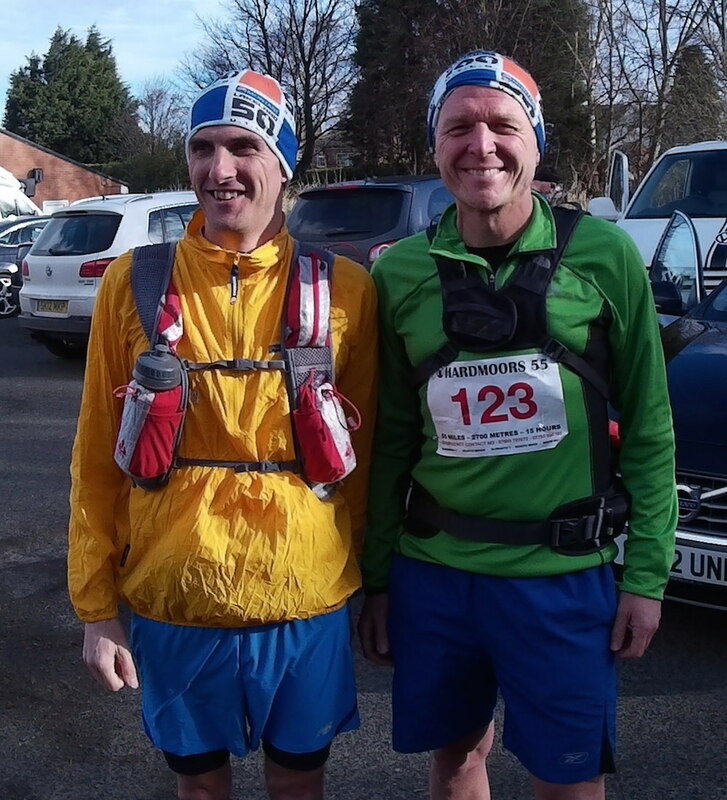 Neil caught us after 15mins org so and we continued to run together. I said again that if they were feeling good not to wait for me. Neil said that was fine but if he was struggling we had to wait for him!! At one point a gap did develop and again I wondered if they were away but I caught them again. When we arrived at Sutton Bank Neil’s wife was waiting for him and he stopped to eat some more. He explained that he’d had some issues with food and was trying out some things. Jamie and I ran on to the checkpoint at the White Horse Car Park. Jamie’s wife and daughter were waiting for him for the latest hid and seek so he pushed on and I followed. I could feel my legs a bit more now on the downhills but I was generally happy that I was still able to run strongly. I refilled my bottle with coke at this checkpoint for the final 9miles. Jamie and I climbed out up the steps waving to his daughter as we went. I now had just over 2hrs to run the final 9miles. Barring disaster then my sub 10.30 was in the bag and I started to think I could get nearer 10.15! I thought about my Guess My Time Competition and who might in the running for the prize! I decided to break down the 9 miles into 3 mini-sections of 3 miles. I can run 3 miles no problem, then another 3 and I’m onto the final 3. It feels so much easier than running 9 miles!! Jamie and I continued to chat and run all the downhills and flats and walk the uphills. We were keeping a steady pace. After about 2miles Neil caught us and was going well. He went past and Jamie went with him and I knew that was the last I’d see of them! As they ran off I heard Neil say we can get under 10hrs if we push!! I think they made it so well done to them and thanks for helping me along over a good 15miles since Osmotherly! I had discovered that Jamie has run 2.50 for a marathon so I was not surprised they left me for dust! So I was now on my own and working out what I needed to do. I arrived at Cold Kirkby right on 3miles so I used that as my mini-split. I now had 90mins to cover the final 6miles and I knew it was basically downhill! I settled into a good steady pace counting my breathes and enjoying the feeling of still running strongly after 50miles of running. I glanced at the Suunto which was on average pace for the split to see I was running under 10mins per mile pace! Excellent. I ran the middle 3.08 miles in 30:34. I caught up with a couple of guys who were running together. We ran for a bit together then I pushed on and later they went past me again. I ran as much as I could for the final 3 miles were it did include some climbs so my average pace dropped a bit. It was starting to get dark as it was almost 7pm. I was hoping to finish without putting on my head torch but once I got into the woods I decided to get it out of my bag and I’m glad I did as it was very quickly became very dark. I was looking for the 90 degree turn left then 90 degree right at the top of the hill as I remembered that was the final bit before dropping down to Hemsley. I kept checking my Suunto as I didn’t want to make a silly mistake so close to the end! I ran past the official start of the Cleveland Way, down the street, turned right and then across to the road to the square and the finish at the Town Hall. Katrina was sitting there taking the times. She had sat there for a few hours welcoming in the finishers. My official time was 10:10:24 and I finished 32rd! I was very happy with run. Shoes off then a final climb up the stairs to the upstairs room. A big round of applause, a lovely medal and t-short and some lovely food. Dave came back from his camper van and we chatted about our races. Dave finished 6th in 8.57 was also very happy. I finished 73mins behind him so inside my 90min target!! Alan Craig and Dave Mull won my competition with their 10.11.12 guess! Not quite sure how it will work with the prize. My friend Jonny suggested they could have a sock each!! Finally I just want to say a massive thank you to Jon, Shirley and each and every marshall and helper who gave up their time to make the race a massive success! If anyone is interested here are HM 55 JK splits. 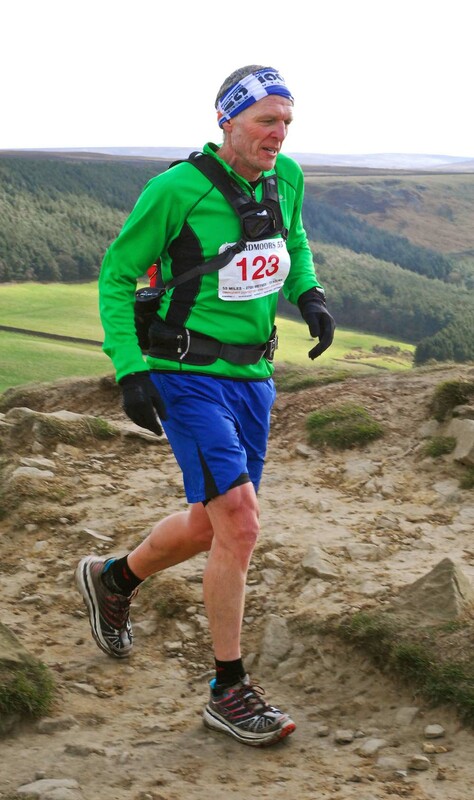 This entry was posted in Hardmoors 55 race report. Bookmark the permalink. You got yourself a nice birthday present there, John! Looking good all the way, well done! Loved your race report! Great job. Sounds like you had a fantastic day out there.